Shop for medications to treat your dog's separation anxiety at VetDepot.com. It is unclear why some dogs experience separation anxiety and others do not when left alone at home. What is clear is that it can be a trying situation for any dog owner. During bouts of separation anxiety, dogs often urinate or defecate in the house, howl or yelp loudly and continuously, bark incessantly, chew furniture and other objects, and dig or scratch at doors and windows. They may become hyperactive when they sense that you are about to leave or when you return home, become depressed prior to your departure, or follow you around constantly while you are at home. These behaviors are not your dog’s attempt to punish you for leaving; they are expressions of panic and stress. "For your pet’s well-being and your own sanity, it is essential that you take appropriate measures to remedy separation anxiety." While it may seem obvious that your dog suffers from separation anxiety, only your veterinarian should ultimately make that determination. Underlying medical conditions can cause the various symptoms and behaviors outlined above. Have your veterinarian exclude possible medical concerns and ask for advice on coping with your dog’s separation anxiety. Several changes to your own behavior may quell mild separation anxiety. 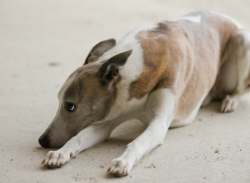 Stop giving your pet excessive attention before leaving and immediately upon returning home. Stick with a simple “goodbye” and “hello” with a brief but affectionate pat. When you come home, wait for your dog to fully calm down before showering him or her with attention. Also, it is helpful to end your dog’s particular associations with your departure. For example, put your shoes on or pick up your keys periodically when you are not leaving. Provide your dog with one of your shirts or another item with your scent on it for comfort while you are away. 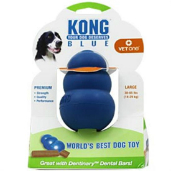 A Kong dog toy stuffed with treats can be helpful, too; keep these toys hidden while you are home and make them accessible while you are gone. For dogs with severe separation anxiety, it is often best to arrange for someone to keep your dog company while you are away until the situation improves. Another option is to board your dog if you will be gone for a significant period of time. Another option is the Adaptil Plug-In Diffuser. The diffuser contains D.A.P., or dog appeasing pheromone. This is similar to the pheromone that mother dogs give off around their puppies to keep them calm. The Adaptil plug-in can help keep your dog relaxed when you're away. As with humans, physical activity is a great stress reducer for dogs. Go for a run or play actively with your dog before leaving. This tires your pet so there is less energy for destructive behavior in your absence. Such efforts are a good idea because they also benefit your dog’s health and your own, provide necessary stimulation, and encourage bonding. In cases of significant separation anxiety, a medication may be necessary to prevent destructive behavior and to ease your dog’s suffering. A selective serotonin reuptake inhibitor (SSRI) such as Reconcile is an effective option for use in conjunction with behavior modification tactics and therapy. Some methods used to try to curb separation anxiety-related behavioral problems are entirely unhelpful. Punishment is ineffective and can easily make the situation worse; remember, your dog is acting out of emotional stress, not spite or a desire to cause problems. Although crating may protect your couch or door, your dog will act out the same behaviors in confinement and is more likely to self-inflict an injury while trying to escape. Leaving a radio or television on will not comfort a dog suffering from separation anxiety. Obedience training is also not a helpful tool for this situation, as the problem is caused by anxiety and is not a form of disobedience.